Desert Ridge is a master planned community in N/E Phoenix, AZ. Desert Ridge. This community offers over 4,000 homes. 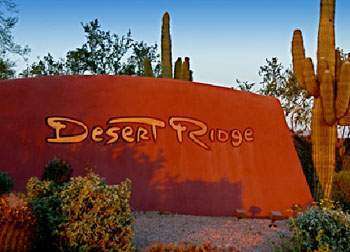 Desert Ridge is conveniently located to the Desert Ridge Marketplace, JW Marriott Desert Ridge Resort and Spa, Mayo Clinic Hospital and American Express regional campus. Desert Ridge Marketplace is a 1,200,000 sqft retail and entertainment center. In addition to may shopping and eating opportunities, Desert Ridge Marketplace also has a splash pad, children’s play area and live music at the Districts Stage. Desert Ridge is part of the Paradise Valley Unified School District. The community is home to 4 schools ranging from kindergarten to 12th grade.